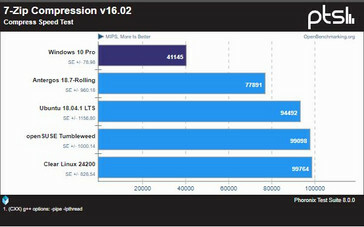 Phoronix has done a performance comparison of the AMD Threadripper 2990WX in Windows 10 Pro and Linux and the results show Threadripper numbers significantly lower under Windows 10 Pro than in Linux. 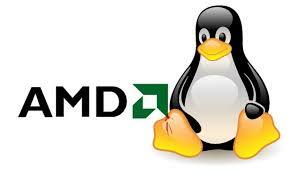 In some tests such as 7-Zip Compression, the Threadripper 2990WX posted almost 58% higher scores in Linux compared to Windows 10 Pro implying that Linux is a better OS of choice when testing high core count CPUs. The AMD Ryzen Threadripper 2990WX is a beast of a chip that has been wowing reviewers all over. Most reviews (including our own) focused on the performance of the chip under standard test suites running on Windows 10 Pro. While the Threadripper 2990WX was absolutely ahead of the Core i9-7980XE, there were instances where it was shown to trail behind even the Ryzen 7 2700X or the Core i7-8700K. The current thinking alludes this to lower memory bandwidth on the Threadripper 2990WX but Linux benchmarking site Phoronix has a different reasoning. Phoronix's tests show the Threadripper 2990WX perform anywhere between 15 to 50% better on Linux and the reasoning behind this is the poor support of Windows 10 Pro for high core count Non-Uniform Memory Access (NUMA) setups. NUMA is all about scalability and it doesn't take a genius to realize that the Linux kernel is one of the most scalable kernels out there — the default CFS scheduler in Linux can scale up to 4096 cores on a NUMA architecture! Phoronix's Open Benchmark suite is cross-compatible across Linux, Windows, macOS, and FreeBSD and employs a myriad of CPU-specific tests. 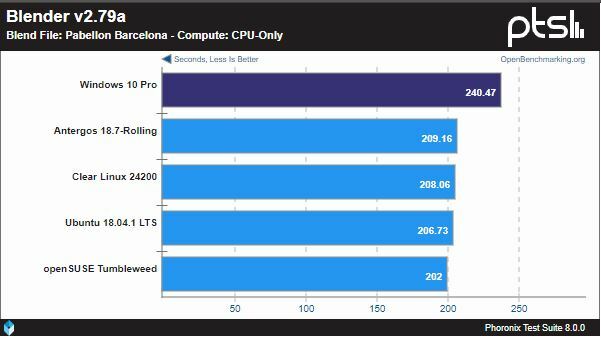 The performance of the Threadripper 2990WX was evaluated in Windows 10 Pro alongside various Linux flavors including Clear Linux 24200, Ubuntu 18.04.1 LTS, Antergos 18.7-Rolling, and openSUSE Tumbleweed. 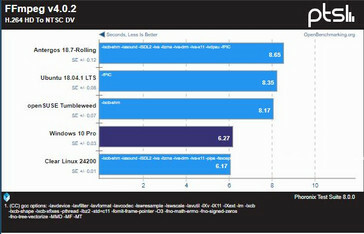 While differences in numbers were seen between Linux distros, Windows 10 Pro posted the lowest of all in almost all tests. 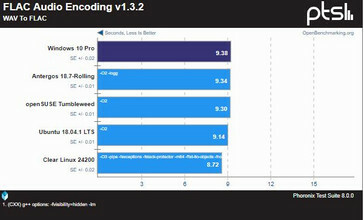 In the 7-Zip Compression test for example, the performance of the Threadripper 2990WX was 2x faster in Clear Linux and openSUSE Tumbleweed compared to Windows 10 Pro. In all Blender tests, the performance on Linux was clearly better by at least 15% compared to Windows 10. 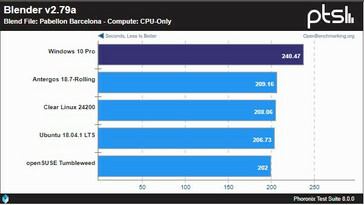 However, in single-threaded tests such as FLAC Audio Encoding and BLAKE2, the Threadripper 2990WX performed almost equally across Windows 10 Pro and Linux. FFmpeg also favored performance under Windows 10 compared to most other Linux distros. Therefore, these results seem to indicate a scalability issue of Windows 10 Pro across the many CPU cores in heavily multi-threaded workflows. Whether Microsoft would update the OS scheduler to play nice with high core count CPUs such as the Threadripper 2990WX remains to be seen. Scheduling issues in Windows 10 were reported even when the Ryzen 7 1800X was first announced but AMD denied any such issues. It remains to be seen whether Windows 10 Pro for Workstations has support for NUMA or not. Although Windows Server and Hyper-V on Windows Server support NUMA, not many would prefer installing a server OS for running consumer/prosumer programs. These are just some of the initial impressions, though and a thorough investigation is in order to find out if scheduling is indeed the reason for lower performance numbers in Windows 10 Pro. Check out the full review results on Phoronix at the Source link below and let us know what you think. A primer about NUMA and its implications in high core count setups is available at the Microsoft Technet blog.